Gary Reynolds has been a member of APPA since 1981, including APPA President. He has also served as faculty member of the Facilities Management Institute, co-director of CFaR, and book editor and author of numerous articles in Facilities Manager magazine. He is also the former content coordinator for the Operations and Maintenance section of the APPA Body of Knowledge. This section was originally written by J. Richard Swistock, and was updated by Gary Reynolds in 2010. Facilities maintenance and operation are on the threshold of radical change at most colleges and universities. This change is being driven by many of the same forces that are reshaping all of higher education: changing demographics; the demand for accountability; and competition for resources, talent, and students, to name a few. Technical issues that challenge facilities maintenance and operations personnel include keeping up with advances in information technology, maintaining sophisticated building environments to support research activities, dealing with antiquated facilities, and meeting ever-increasing environmental and safety demands. Responding to these challenges while providing better customer service and becoming more cost-effective in a changing environment will require a new look at traditional facilities maintenance and operations organizations and the way they function. This section suggests organizational changes that may be appropriate. This introduction was written for the third edition more than 10 years ago and remains relevant today. The mission of the facilities management organization is to provide a physical environment that enables a university or college to accomplish its broader mission. This environment consists of buildings, grounds, and other campus facilities. Maintenance and operation of these facilities can be justified only if they enable the university community to effectively pursue teaching, research, public service, and other supporting activities. The facilities are maintained not for their own sake, but to provide, within available resources, the best possible environment in which the university community can function. The physical assets of a college or university represent a large investment, and this investment must be managed with the same care as other valuable assets. Because institutions of higher education are generally thought of as existing in perpetuity, there is a tendency to think that campus facilities should also exist in perpetuity. Some buildings and campus facilities have historical significance and should indeed be maintained and preserved as such. Most facilities, however, exist to enable an institution to accomplish its mission and should be maintained, preserved, renovated, or disposed of based on the best business interests of the institution. In other words, the facilities management organization must meet the needs of the users of facilities, not simply maintain and operate facilities. For further discussion, see the section on recapitalization management. Preventive maintenance is the cornerstone of preserving a college or university's real property assets and ensuring that physical facilities support the institution's mission in the most cost-effective way. Preventive maintenance should be the guiding philosophy of an effective maintenance organization. Because preventive maintenance is accomplished on a scheduled, predictable basis, it is the maintenance activity that is least visible to the university community, and its benefits are not always obvious in the short term. For this reason, there is sometimes a tendency to minimize investment in the preventive maintenance program or to postpone elements of the program when budget or workforce resources are limited. Responsible facilities managers cannot allow this to happen. Details of preventive maintenance systems are discussed in the section on work management. In addition to maintaining buildings and grounds and structural, electrical, and mechanical systems, an effective maintenance program provides housekeeping, grounds care, and maintenance activities such as painting and window washing that ensure the aesthetics and general attractiveness of facilities. Because college and university campuses are generally open to the public, and because much of the ultimate success of the institution depends on the perception that students, parents, faculty, staff, and visitors gain while on campus, the appearance of facilities is essential to the success of the institution's mission. See the APPA's Center for Facilities Research definitive study on this topic (APPA Bookstore). At most colleges and universities, renovations and construction activities are constantly in progress. Maintenance of new or renovated facilities will be the responsibility of the facilities maintenance organization. To ensure that these facilities can be effectively maintained and to maximize their contribution to the university's mission, the maintenance management staff should be involved in their planning and construction. This will help ensure compatibility with existing systems, allow maintenance workforces to receive any special maintenance training needed, and expedite putting the facilities into service. As institutions strive to become more cost-effective, cost concerns are properly addressed to the facilities management organization, and facilities managers must make cost-effective business decisions. Again, plans and actions must support the larger university mission. Many institutions have traditionally provided basic maintenance services with in-house workforces. In some cases, the private sector can provide the same quality and levels of facilities management services as in-house workforces, sometimes at a lower cost. An objective comparison between private sector costs and in-house costs for the same maintenance services can provide sufficient basis and motivation for improving in-house efficiencies. Periodically such objective comparisons should be made. When computing in-house costs, care must be taken to ensure that all overhead and administrative costs are taken into account. Similarly, when computing the cost of contractor-provided services, the cost of contract management must be taken into account. APPA has several publications outlining the issues that should be considered (APPA Bookstore). Maintenance managers are usually responsible for institutional compliance with building costs, life safety codes, environmental and other regulations, including from the Occupational Safety and Health Administration (OSHA) and the Americans With Disabilities Act, and perhaps other external compliance and regulatory matters under the purview of other jurisdictions having authority. Many of these regulations are constantly evolving and have a significant effect on the way maintenance activities are conducted and on the cost of these activities. Maintenance managers must also be aware of cost implications of such codes and regulations for current and future institutional budgets. For example, regulations regarding control of chlorofluorocarbons have significantly increased the cost of maintaining older air-conditioning and refrigeration systems. In many cases, large investments in capital improvement are necessary to ensure compliance. For example, OSHA worker safety regulations, such as rules for confined space entry, are requiring training and certification for some maintenance employees, and many maintenance activities must comply with regulations of the Environmental Protection Agency, including regulations relating to asbestos abatement, underground fuel tank management, aboveground storage tank management, and air and water emissions. Requirements for management of hazardous materials, disposal of solid waste, and recycling are also of concern to the maintenance manager. Noncompliance with regulations can cause significant problems and costs for the institution, ranging from bad publicity to significant fines and regulation of activities. Maintenance managers must be aware of requirements and regulations that affect maintenance operations, and they must work closely with institutional safety and materials managers and legal and other departments to ensure that the institution's interests are protected. A more complete discussion of these issues can be found in the section on environmental health and safety. It is clear that facilities maintenance and operations reach far beyond the actual maintenance and operation of physical facilities. The reason for maintaining facilities and providing building services is to provide the environment in which the university community functions. This university community, including students, faculty, and administrators, is the direct customer of the facilities organization. However, facilities managers must also serve the needs of the ultimate customers of the university community, sometimes referred to as stakeholders. Stakeholders include campus visitors, parents of students, civic and community groups, government officials, and benefactors. The section on communication provides a complete discussion on communications with customers, but a few key points should be highlighted within the context of facilities management. This diverse group of customers determines whether facilities management organizations are accomplishing their mission adequately. For instance, if customers believe that housekeeping services for a building are inadequate, then housekeeping services are indeed inadequate, even if management standards are being met. The bottom line is that customers determine what level of maintenance and service is adequate. Facilities management must understand what its customer expectations are and meet them. If customer expectations are unreasonable, uneconomical to achieve, or unattainable, then facilities managers must communicate with their customers, educate and inform them, and ultimately convince them to accept a different standard. However, facilities management cannot unilaterally set standards, not only for housekeeping, but also for environmental aspects of the campus such as lighting levels and temperatures, as well as maintenance standards for painting, carpet replacement criteria, and grounds and horticulture investment and maintenance standards. Customers even set standards for preventive maintenance by determining acceptable levels of risk of failure in building systems or components. Communication with and education of customers regarding maintenance standards and level of service are critical to the success of the facilities management organization. This communication and education takes many forms, from informal conversations between first-line workers and customers to formal institutional maintenance and service policies and directives. To ensure proper external communication with customers, good internal communication within the facilities organization is critical. Facilities managers must manage this communication at all levels. 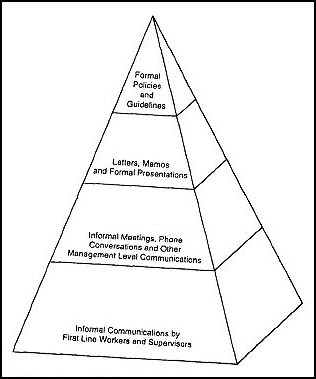 One model for communication between the facilities management organization and customers can be viewed as a pyramid, as illustrated in Figure 1. At the top of the pyramid are the most formal kinds of communications: policies and guidelines, usually directed from top management. As communications with customers proceed down the pyramid in the facilities organization, they become less formal. However, the amount, intensity, and influence of the communications on the effectiveness of the organization increases. The most important communications occur at the base of the pyramid (i.e., informal communications between customers and staff who directly provide services, such as housekeepers, air conditioning technicians, and receptionists). Because of the important impact of these informal communications between first-line workers and faculty, staff, and students, it is obvious that facilities management must communicate well with first-line supervisors and service providers to ensure that these individuals represent the facilities department well. Current organizational structures usually include several layers of management or supervision between top facilities management staff and first-line service providers. Each level serves as a filter and interpreter of senior management communications. Even formal directives and guidelines are subject to such interpretation. Therefore, special efforts should be made to ensure that accurate and complete communications reach down through the organization. Written communications, for example, must reach everyone. In addition, for communication to be effective down through the organization, it must be effective coming up through the organization. If top management believes that full and correct information is not coming from the lowest levels of the organization, then it is a good assumption that full and correct information is not getting down through the organization. Although most communication must follow the chain of command, top management should periodically communicate directly with all levels of the organization. Visits to work sites and shop walk-throughs provide opportunities for upper management to communicate informally with personnel who provide direct services. Periodic meetings with first-line supervisors and workers are a good opportunity to ensure that these important people receive unfiltered communications. Communications between facilities managers and customers is often achieved through a system of facility representatives. A facility representative may be a departmental business manager or staff person, an assistant dean, or someone associated with the support of the educational, research, or patient care mission of a school or department. Whether formally designated or not, there is usually such a representative at each major building on campus. They are the individuals who most frequently initiate service calls to the facilities organization, and because of this role, they are also the individuals who serve as the principal communication link between customers and facilities building managers. To be most effective and helpful to the facilities organization, these individuals should be formally designated and viewed by their departments as being influential in the facilities organization. Facilities management staff and supervisors should pay special attention to these facilities representatives. They should have advance information regarding work in their buildings and scheduled utility shutdowns. They are an invaluable source of information concerning customer expectations and perceptions about facilities maintenance and services. For facilities representatives to be effective, they should receive copies of maintenance and repair work schedules and notices of completion of work. Semiannual or quarterly formal meetings should be held with them to advise them of coming seasonal efforts (e.g., inclement weather planning) and other issues (e.g., energy conservation initiatives and service enhancements). These meetings are also an opportunity for facilities representatives to provide feedback directly to top management about the facilities organization. By keeping building managers informed in advance, they can become advocates of the facilities organization in customer departments. Regardless of the formality of the building manager system, it is a crucial element in facilities management-customer communications. Another component of good communications is the use of customer service representatives on the facilities staff. Such representatives are present in any large, effective customer service organization. Within facilities management organizations, these individuals should have primary responsibility for ongoing coordination and communications between facilities management and facilities users. This function may be performed as a collateral duty by senior staff at a smaller institution, or by a specifically assigned full-time individual at a larger institution. The important thing is that someone should have primary responsibility for coordination with customers. The person in this position also acts as an ombudsman and should be viewed by customers as the one who can get potential problems solved before they become major customer issues. Facilities organizations should also have some organized form of work reception and control, where customer requests for service or maintenance are received. Because such requests are often the first contact a customer has with the facilities organization, it is important that this function be handled professionally and with a good customer service attitude. Reception must also handle customer follow-up on work requests. To minimize customer frustration, it is important that reception personnel have good telephone skills, and it is important to have a good system for tracking the status of work orders, including good communications between the reception desk and maintenance shops or zones. Facilities maintenance and operational services are provided by first-line employees and are most directly influenced and guided by first-line supervisors. The importance of these first-line workers' supervisors cannot be overstated. At higher levels, supervisors and managers establish policies and guidelines and provide resources, support, and guidance to these first-line supervisors and their employees. Facilities maintenance and operation activities take place in many different campus buildings, frequently with minimal direct supervision. For this reason, employees must be self-motivated, productive, and competent in customer service. Supervisors must communicate well with and empower their employees and follow up wherever necessary to ensure that customer needs are truly and effectively met. Providing training and development of employees is the responsibility of management. Because first-line employees work with a high degree of independence and have frequent contact with customers, a comprehensive training program is essential. Training of the facilities workforce must include more than technical and job-related elements. Customer service communications and an understanding of the institution's mission and goals must also be included. The facilities maintenance and operations organization must be structured to administer widely diverse work groups. Facilities maintenance and operations are much different from teaching and research operations. They include receipt of customer-requested work, proactive maintenance, facilities preservation, and renovations of facilities, as well as building-related services, maintenance of utility systems, and energy management. Thus, the administrative and support functions of the organization will usually not resemble those of other institutional departments. The section on organization provides a thorough review of facilities management organizational structures. Within those structures, administration and support functions usually include cost accounting, construction and service contract management, and procurement of materials and services, as well as management of information and data systems, facilities engineering, and architectural services. The traditional facilities maintenance organization comprises craft or trade shops. For example, the electrical shop is traditionally responsible for maintenance of all electrical systems, and the carpentry shop for all cabinet work and carpentry functions. These shops usually receive work input from a work control center that manages the preventive maintenance program and receives customer-generated work. The control center establishes work orders, issues them to the shops, and provides appropriate input to the accounting system. The trade shops may be centrally located and managed; on larger campuses, satellite shops may be established to maintain parts of the larger campus. Under a trade jurisdictional model, each shop is responsible for all campus maintenance and repair work associated with its trade. In a variation of this model, a separate preventive maintenance shop is sometimes established to perform routine preventive maintenance such as filter changes, lubrication, and equipment checks. Under this model, repair work identified during preventive maintenance is usually passed to the appropriate shop for execution. Management and work control may be centralized or decentralized with the shops. The latter model is frequently used when an institution has two or more separate campuses and in effect operates multiple, separate facilities operations. All trade shop organizational models derive from the traditional trade jurisdictions of the construction industry. A concept gaining more favor is that of multicraft maintenance teams. In one version of this model, maintenance teams consisting of trades from traditional crafts (e.g., carpentry; plumbing; electrical; heating, ventilation, and air conditioning [HVAC]) and occasionally others (e.g., sheet metal work) make periodic visits or sweeps in campus buildings and address preventive maintenance activities and other maintenance calls that have been identified since the last visit. A more recent variation of this concept is the use of multitrades-skilled craftsperson who addresses all routine maintenance requirements in a facility. An experienced multitrade-skilled craftsperson can usually accomplish more than 90 percent of scheduled preventive maintenance tasks and complete more than 80 percent of routine maintenance calls. The remaining preventive maintenance work and maintenance calls must be referred to specialty shops. A more sophisticated model of the multitrade-skilled worker concept is zone maintenance. In zone maintenance, the campus is divided into conveniently sized zones, usually 300,000 to 1,000,000 square feet, and a team of multitrade-skilled craftspersons is assigned to each zone. A team leader usually reports to the director of maintenance or the assistant director of the facilities organization. Team size varies with the complexity, intensity of use, and size of the buildings in the zone. There should be 6 to 15 workers to ensure a reasonable span of skills for the team leader to employ. The team leader should be the only supervisor on the team. The team is responsible for all preventative and regular maintenance in their assigned zone. Most of the work is accomplished by the team, but team leaders may draw on support shops or contractual services to complete work that is beyond the team's capabilities. There are several strengths to zone maintenance. Building managers and other customers who work with the facilities department soon learn that their zone team is the source of maintenance work in their spaces, thereby facilitating customer communication. Teams are usually headquartered in a building within their zone, which can also enhance service. The zone team members are field workers, not shop fabricators. Therefore, zone headquarters need not be a traditional shop, but rather a location where team workers organize and from which they are dispatched. Traditional shop work such as carpentry and cabinetmaking, welding and sheet metal fabrication, and bench repairs to motors and other components is performed by support shops outside the zones. The zone concept also decentralizes responsibility and decision making, which can improve efficiency and work quality. Maintenance and repair work done by support shops or by outside contractors is controlled by the zone team and funded from the zone maintenance budgets. The zone team leader is responsible for and has the authority to manage maintenance in his or her zone buildings. A traditional work control or customer service center still performs the same tasks (e.g., issuing and monitoring work orders), but the zone team remains responsible for coordinating and completing all required maintenance and repair work in their assigned buildings. The zone should be structured so that the team consists of a leader and 6 to 15 multitrade-skilled workers at various proficiency levels. A typical 10-person zone team would have two to three highly skilled journey mechanics who could perform initial diagnosis and troubleshooting of building HVAC, electrical, and plumbing systems, and three to four less experienced mechanics who would be capable of addressing traditional carpentry problems such as window and door malfunctions, routine plumbing, and routine electrical and HVAC problems. A third tier of staff would be capable of completing routine preventive maintenance work such as filter changes, equipment lubrication, lighting maintenance, and painting, and would assist the other mechanics as necessary. For team members, this organization provides a career ladder from entry-level maintenance worker to highly skilled multidisciplinary technician without requiring formal supervisory responsibilities. The zone maintenance organization eliminates coordination between the shops; clearly fixes responsibility for work accomplishment; and encourages development of a better trained, more versatile workforce that takes ownership of their buildings. Zone maintenance organizations usually require fewer supervisors and are more efficient than conventional trade shop organizations. Although the concept of multicraft maintenance mechanics is not new to many private-sector property management companies and small institutions, it represents a major conceptual change for many large public institutions. The zone maintenance concept is also contrary to the traditional trade shop organization, which developed from the construction industry. However, today's modern building technology with integrated building systems involving door locking and security systems, lighting and HVAC and energy systems, elevators, and fire alarm and control systems requires an integrated building maintenance concept such as zone maintenance. Having the correct materials available to maintenance personnel when needed is essential for effective operations. Regardless of the system used, materials should be made available to field personnel with minimum effort. Preventive maintenance consumables, such as filters and drive belts, should always be readily available before work is started. When unpredicted requirements develop during the course of a job, a system that delivers the materials to the site is better than one that requires the mechanic to leave the job site to obtain materials. With good planning, materials can usually be provided or stored on the job site, or the maintenance worker can take all materials needed to the site at the start of the job. Materials for preventive maintenance work, such as lubricants, filters, drive belts, and fluorescent tubes, can be pre-positioned in mechanical rooms or secure spaces in buildings where they will likely be used, and maintenance vehicles can be outfitted with commonly required materials. A good measure of the effectiveness of the materials support system is how often a field worker has to return to a shop or warehouse or to a vendor for needed materials before a task is completed. Ideally, this should rarely occur. If a review indicates that workers are making frequent trips from work sites to obtain materials, a system for delivering materials to the work sites should be explored. Storeroom inventories are expensive to maintain. Modern materials management embraces the "just in time" concept, whereby on-hand inventories are reduced and materials are made available through arrangements or contracts with vendors, either on a scheduled basis or on short notice as needed. In effect, vendors' inventories take the place of storeroom inventories. The section on materials management has a more detailed discussion of storeroom operations and inventory management. Because maintenance materials requirements are hard to accurately predict and many times small quantities of an item are needed, it is common practice for shops to have pre-expended materials on hand. Such inventories, although necessary, are difficult to control and manage and should be kept to a minimum. There is a requirement in every maintenance organization for emergency spare parts and equipment. These items must be stored in secure areas but be readily available to after-hours maintenance and repair crews. The items should be carefully inventoried, and usage data should be maintained and periodically reviewed to ensure that only items used for emergencies are carried in the inventory. Traditional management techniques evaluate the need for inventory based on turnover, but for emergency spare parts this may not be appropriate. Rather, the inventory should also be reviewed in terms of risk. For example, if an expensive valve is needed to maintain the functioning of an equipment item that is essential to the operation of a facility, even if the valve may fail just once in 10 years, it may be prudent to keep it in inventory. Ideally, all materials used in maintenance should be charged out against the building or against specific building systems and equipment when appropriate. These costs, along with labor costs, should be accumulated in a hierarchy file to maintain accurate maintenance and repair costs for specific buildings and building components. Since the 1960s, most facilities management organizations have been applying engineering principles to the management of the facilities workforce. It is more difficult to predict and schedule maintenance and service activities than production activities. However, using principles of industrial engineering, maintenance and service work, particularly preventive maintenance, can be defined into units that are quantifiable. This allows for effective work scheduling, comparing work output with standards, and analyzing efficiency, all of which can help management to optimize efforts and improve efficiency of the workforce. The four techniques most often used when applying industrial engineering principles to facilities operations are work sampling, work measurement, value engineering, and work simplification. All four are useful techniques, but their application must be tempered with recognition of the importance of customer service and the utility of empowerment of first-line workers and their supervisors. Work sampling is a statistical approach to quantifying work. Work elements are randomly sampled, and the results are analyzed to identify areas where process changes, training, and management or supervisory intervention are required. Under this approach, activities of a facilities organization can be categorized as productive work, indirect productive work, and nonproductive effort. These activities can be further refined into their respective elements. Productive work is direct effort used to produce a final desired result. Productive work includes activities such as measuring, cutting, and fastening items in place. Indirect productive work includes activities such as planning, materials procurement and handling, and travel time. Nonproductive effort is time that adds no value and does not directly contribute to a final desired result. This includes idle time waiting for transportation and materials, or anything that delays a productive job. It also includes cleanup time, breaks, training, and other time that does not directly support a productive job. The principles of work sampling and categorizing should be familiar to all supervisors, and formal work sampling should be part of any major organizational or process changes that are contemplated in the facilities organization. Work measurement involves the application of time standards to any element of work. Time standards may be published, universally accepted standards, or they may be established by first-line supervisors and informally applied to work elements. They should be quantified and agreed on by first-line workers, supervisors, and managers if they are to be meaningful in measuring and approving work performance. Local standards can be developed based on historical performance, current work practices, and judgment. Value engineering is usually thought of as techniques to ensure cost-effective design of buildings or other facilities and usually involves life cycle costing. The principles of value engineering can be applied to decisions about replacing building components, energy use, and maintenance. For instance, analysis may lead to a decision to perform preventive maintenance on window air-conditioning units once a year rather than twice a year, or analysis may indicate the effectiveness of converting some lighting systems from fluorescent to high-intensity discharge, or installing motion or ambient light sensors to turn lights on or off. Empowered first-line workers and supervisors can initiate useful value engineering ideas. Work simplification techniques review each element of a job task with the intent of doing it in a more effective manner. Again, empowered employees and first-line supervisors should be encouraged and rewarded for work simplification efforts. The mission of the facilities department, as discussed earlier, involves providing the environment in which the institution functions in the most effective and efficient manner possible. In many cases, this requires facilities management to provide maintenance and services completely with institutional employees. In other cases, it is more effective to have outside vendors provide services. The section on contracting for services provides a detailed discussion. Some key points are made here. Maintenance and operations of modern buildings have become technically demanding because of integrated building systems, sophisticated building controls, and security and energy management systems. In many cases the facilities department does not have the technical capability to effectively manage and operate these systems. When such buildings and systems are put into service, facilities management must develop the needed capability in-house or contract with capable vendors. Legal requirements for asbestos abatement, lead paint removal, and hazardous waste handling and disposal may also provide reason to contract for services. And seasonal functions such as grounds maintenance may be more effectively contracted, as contractors usually have more flexibility to vary staffing quickly and easily. One of the hidden costs in providing seasonal or variable services with in-house staff is finding truly productive employment for personnel during the off-season or at slack times. Services that are relatively low skilled and labor intensive can often be more economically provided by contractors. Painting and housekeeping are examples for which local labor markets may allow contractors to pay wages that are considerably less than those paid to institutional employees. Frequently the cost of employee benefits is less to contractors who perform these services. However, when evaluating the cost of in-house versus contractual services, it is important to consider the cost of contract administration and quality control inspections of contractor work. As building systems become more sophisticated, often in response to more demanding environmental and life safety requirements, contracting with vendors who have specialized expertise in maintaining the systems should be considered rather than developing full in-house capabilities. In some cases, there may be code requirements for licensing that add to the cost of using in-house staff. For example, elevators with sophisticated control systems, automated building systems, fire alarm and suppression systems and other proprietary equipment, and life safety systems frequently are best maintained by vendors with highly trained technicians. Facilities management staff must develop adequate technical expertise and knowledge of these systems to properly manage the contracts. Competitive bidding is the traditional method for procuring construction and maintenance services when full scopes can be clearly defined. For situations where repetitive work is needed but the quantity of work is unknown, it is common to use open-ended contracts with unit costs established for a specific time period, usually one or more years. Painting and carpet installation are examples of such procurements. Another form of open-ended contracts based on unit costs are hourly service contracts for trade workers such as carpenters, electricians, and plumbers. Such contracts can be competitively bid on a unit cost basis or negotiated with selected vendors. Regardless of the form of the contract or the services provided, contract administration by the facilities organization must include an effective quality control and inspection program. Timely inspections and feedback to the contractor are perhaps the most important elements of ensuring contract success. The process must be controlled by facilities management, as it directly affects the quality of services provided to institutional customers. Responsible emergency services can be provided by contractors if properly documented and specified in the contract. Elevator maintenance contracts, for example, must make provisions for emergency services, fire alarms, and emergency generators. Other equipment maintenance contracts also must have provisions for emergency responses. It may be appropriate for trained, in-house personnel to respond to specific emergencies, such as passengers trapped in elevators. However, this must be clearly documented in the maintenance contract to ensure proper responsibility and accountability of the contractor. Requirements for emergency response should also be defined in contracts for services such as housekeeping—for example, to respond to floods in buildings or liquid spills at events. If the service contractor is not required to respond to emergencies, then in-house personnel must respond under specific conditions detailed in the contract. In summary, maintenance and service contractors are an effective extension of facilities management capabilities and must be fully managed and controlled by the facilities organization. Many facilities departments provide construction and renovation services to campus customers. This usually involves relatively small projects, often without a fully defined scope or complete plans and specifications, frequently in occupied spaces, and often within relatively short time frames. These conditions often preclude fixed-price competitive bidding by construction contractors. When such work is done in-house, the workforce should be completely separate from the maintenance workforce to avoid migration of maintenance resources to renovation projects. Renovation and construction workload is usually variable over time, and for such work to be efficiently completed, different trade capabilities are required at different times. Because most institutions have a relatively fixed, stable workforce, it may be difficult to perform renovation and construction assignments in an effective manner. For this reason, it is often best to use contractors, even for small jobs. For larger construction and renovation projects, it is important to involve maintenance staff in the review of designs. Front-line staff are very knowledgeable about materials, parts, equipment, and processes used on campus, and they can often provide useful insight as to which design elements will work and which will not, from the location of outlets in hallways to strategies for heating and cooling. Their participation in the review of all designs can significantly reduce the start-up expense of a building and subsequent operating and maintenance expenses. The facilities organization must support the institution's mission and goals. Facilities are not maintained for their own sake, but to provide the best possible physical environment for the university or college community. Preventive maintenance is the hallmark of effective facilities maintenance. It minimizes system failures, system interruptions, and maintenance service calls over the life of a facility. Unlike services such as housekeeping and grounds care, which are extremely visible, preventive maintenance programs are relatively invisible and therefore require careful management to maintain their effectiveness. The effective facilities maintenance and service organization must have a strong service orientation in which first-line workers are empowered and given adequate resources and training to do their jobs. Most maintenance and service operations are accomplished with little continuous direct supervision in spaces not controlled by facilities management. Therefore, the facilities organization must institutionalize a strong customer service philosophy among first-line workers and supervisors. New technologies and greater sensitivity to customers' needs are leading to a maintenance organization philosophy that is less trade oriented (e.g., carpentry; plumbing; electrical; heating, ventilation, and air-conditioning) and more facilities oriented. Under the zone maintenance concept, teams of technicians skilled in multiple crafts maintain total buildings rather than components or single building systems. Maintaining the environment in which the university community functions involves a broad range of facility-related services. To effectively provide these services, good communication with customers is essential and must be managed by the leadership of the facilities organization. It is the responsibility of facilities managers to educate the campus community to be informed consumers of facilities services. To expedite and enhance communications, many organizations define customer representatives or building managers at each facility and communicate with them using trained customer service representatives. A materials management system that provides the proper materials when needed with a minimum of effort by maintenance technicians in the field greatly enhances the effectiveness of the maintenance organization. Although inventory control and accountability are essential ingredients of any materials supply system, the final test of the system is how well it serves field workers. Principles of industrial engineering and work control are useful tools to improve the efficiency and quality of maintenance and other facilities operations work. However, when implementing these techniques, processes, and systems, managers must keep in mind the importance of customer service and communication and the utility of empowering front-line workers with appropriate responsibility. Contractor-provided services are a valuable tool of the facilities manager in providing the most effective services to the institution. Maintenance and services contracting are an effective extension of the internal capabilities of facilities management and must be fully managed and controlled by facilities managers.